The heat of summer took hold again at the start of the week. The rain evaporates, even the promise of rain evaporates. The garden is without brio and sits heavily on the hillside like cold treacle on a spoon. I have a small meadow that is really an excuse to grow early daffodils to cheer in the New Year. When the daffodils end it dabbles gently with bluebells (I can't decide if I want them or not, but the longer I prevaricate the less option I will have). Finally it bursts with a surge of pink campion. It's not clever and it's not very sophisticated, but it brings me pleasure. Walking past on tuesday it made it very clear that it had finished for the year. Time to mow it and hopefully a crisp new surface will restore some freshness to the place. 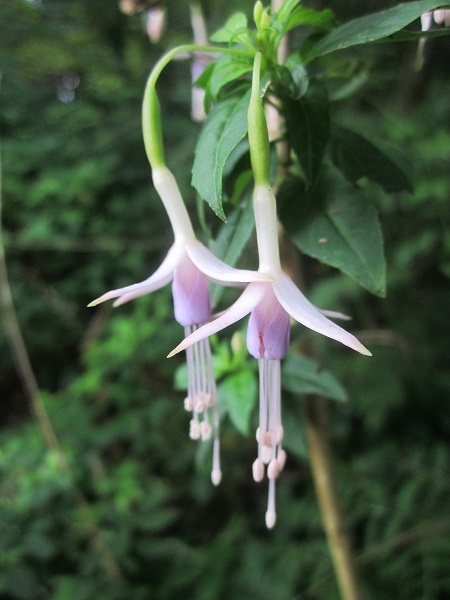 Fuchsias manage to straddle the awkward gap between the moderate weather of spring and the moderate weather of autumn. This immoderate season we call summer. It is quite likely that this is 'Whiteknights Pearl', a beautiful hardy shrub that performs tiny synchronised movements in the still air as though it were breathing deeply in its sleep. It will remain wonderful even if it eventually turns out to be 'Whiteknights Blush' (the other possibility). For safety, the label is buried beside it where it slumbers undetected. And memory, well memory is the day after a student party. The fragments that remain don't always join together. On the principle that I might as well be hung for a sheep as a goat I have been spending time in the greenhouse. I have some new Nerine that I want to have potted before there is any chance of new growth appearing. As the temperature falls in the evening the wooden framework radiates some last warmth in a friendly way. It may be tanalised timber but there is still a majestic suggestion of old forests, ancient moss and dizzy woodpeckers. Sinningia leucotricha seems to prosper, sheltering under its plastic canopy. It has a large tuber at the base, protecting it from extreme drought. It also seems to resist a little frost though I wouldn't want to take too many chances. It would be easy enough to replace but it has taken time to grow a big tuber and I feel part of the process. 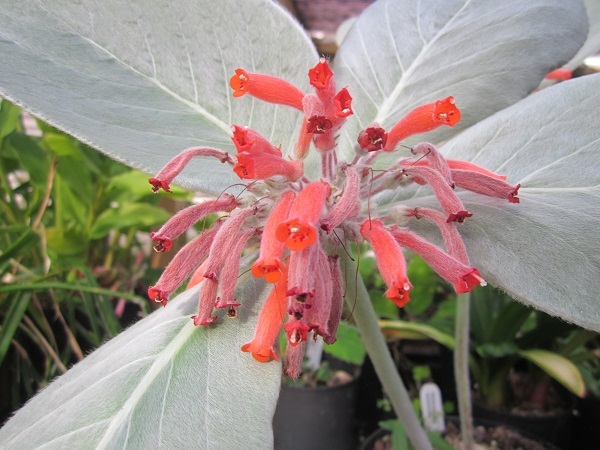 The scarlet flowers and silvery leaves I could replace and scarcely know I had done it but the knobbly tuber is like your first car, something rather special. 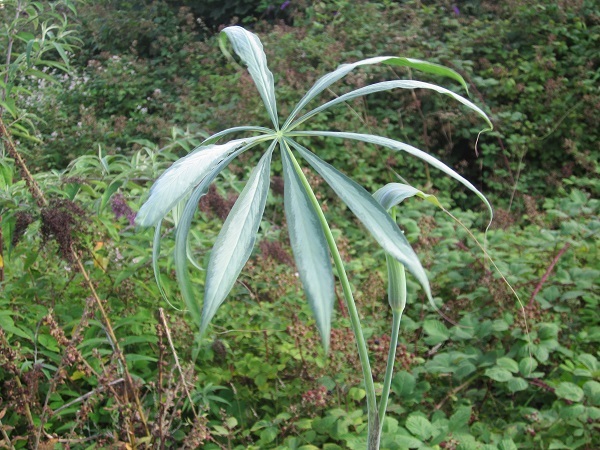 The new leaves will grow into a rosette that overwinters and then in sping a flower spike will emerge from the centre. 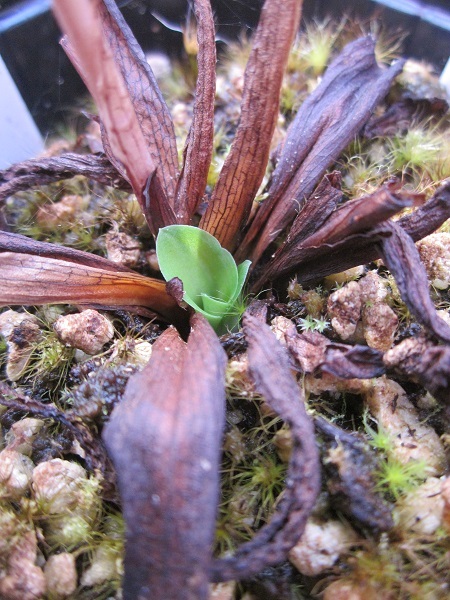 Unfortunately the leaves are not as hardy as D.uniflora and its hybrids and will be damaged by a hard frost. In recent years I have covered it in fleece on cold nights and on several occasions I have covered it on perfectly warm nights when I have had a sudden attack of panic. I'm not expecting gratitude for my care, but like the Giant Panda it could try a little harder to increase. I find it difficult to imagine that any wave would be welcome in a garden but Arisaema (and the people who name them) make their own rules as they go along. I certainly have few suggestions to offer concerning their cultivation. I have grown a number of species over the years but I get the idea that those that persist do so for their own reasons despite my care. The only conclusion I have arrived at it that they like more warmth when in growth than I had previously assumed. Those in the greenhouse do a lot better than sister seedlings planted outside. I also see a lot more prospering clumps in the eastern counties than I do in the west, but it could all be self-delusion. I do as lot of that. My history with the genus couldn't really be characterised as a sparkling triumph and against that background the decision to spend a large sum of money on a very beautiful plant left me as wobbly as a man on a unicycle. The end result was never really in doubt, but I had to walk away for a moment and pretend to think about it. I felt like a child burying birthday money and hoping to grow a money tree. Perhaps it was worth it just to revisit those feelings. Whatever the concerns, I was so excited when the new shoot started to grow I looked away and pretended I hadn't noticed in case it was one of those things that are spoiled by knowledge. Eventually I had to look it square in the eye, if only for the sake of a photograph. I have a much prettier picture of the flower, but I wanted to show the gorgeous silver centred leaflets as well.